It is not often that a critic gets to hear a performer who has all the potential to achieve greatness on the world stage. I have come across three, all of whom, by a curious coincidence, have been singers. In one case I was wrong - although that particular singer went on to achieve eminence in a rather different field - while the second lived up to every word of praise I offered, and has gone on to exceed all expectations I had. Let's see what happens to the third, for I only heard her on Friday evening. This is what I wrote for my Straits Times review. 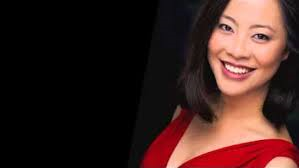 Singapore Lyric Opera’s annual Gala Concert was noteworthy this year for the presence of Singaporean soprano Felicia Teo Kaixin. Her easy and effortless delivery, her beautifully controlled projection, her sumptuous voice and her arresting characterisations mark her out as something very special. Instantly captivating in her opening duet from The Magic Flute, and attracting the biggest cheer of the night for her spectacular Je Veux Vivre from Gounod's Romeo et Juliette, Teo has the potential for true operatic greatness. Tenor Jeremy Koh is, like Teo, a product of the SLO-Leow Siak Fah Young Artists Programme. His voice seems less naturally inclined towards opera, and it felt as if he was nearing his limits in Quanto e bella from L’elisir d’amore. But his is nevertheless a fine, clear voice, and always absolutely pitch-perfect. Sharing the stage with these two relative newcomers were more established soloists. William Lim’s usual avuncular manner seemed to have deserted him, and while he was an ideal partner to Teo in the Mozart duet, and sung a solo from I Pagliacci with great warmth, he looked and sounded stiff. Chinese soprano Wang Bing Bing was far from stiff. Hers is a big, booming voice – with the doors open and the wind in the right direction, it could probably reach some of the outlying islands - but a forceful voice is not everything (whether you are an opera singer or an American President-elect), and Wang’s delivery was often so extreme that it overwhelmed niceties of pitch and rhythm. In her duet with Teo - Belle Nuit from the Tales of Hoffmann – Anna Koor’s mezzo-soprano had a brittle edge, but she brought a pleasing warmth and expressiveness to the Easter Hymn from Cavalleria Rusticana. Rather than the Esplanade’s own organ, the SLO Orchestra used a nasty electronic thing to lend holiness to the Easter Hymn, and it was probably this machine’s irritating top register which caused the chorus some tuning problems. Otherwise, they were beyond reproach. Augmented by two other choirs – Evokx and the Singapore University of Technology & Design – the SLO Chorus was absolutely fabulous. Their performance of the Triumphal March from Aida, aided and abetted by some electrifying trumpet playing from the SLO Orchestra, was about as exciting as music can get. The SLO Orchestra, for their part, was on cracking form throughout. In no small measure this was due to Jason Lai who was making his debut with them. He worked his way through the inevitable collection of short operatic extracts, giving it all a tremendous feeling of coherence. Perhaps Lai’s greatest achievement was in keeping a tight rein on the exuberant SLO Children’s Chorus, even when they seemed about to escape the confines of his direction in the enchanting Evening Hymn from Hansel and Gretel. Totally yet unobtrusively in control, he inspired strong and focused performances from every single performer – child and adult - in this noteworthy gala concert.